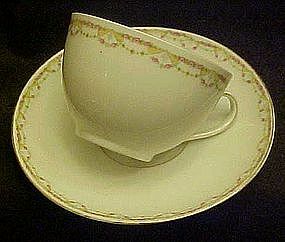 Nice cup and matching saucer set with delicate tiny pink roses with green swags around the edge with gold rim trim. Gold on edge trim is 99% good. No chips or cracks, just great!. China marked M&Z,(M stands for Moritz and Z is for Zdekauer) or just MZ Austria, was made by a company called Altrohlau. They were in business from 1884 to about 1945 when the company was nationalized. They were prolific manufacturers and the quality varies greatly, with most being of average to below average quality. Ihave 2 sets . Price is for 1 cup with matching saucer. I have other pieces to this set listed.